We remember a time when a film came out in the cinema, rental about a year later, then if you were lucky, to buy a year after that. Now things are just crazy fast! 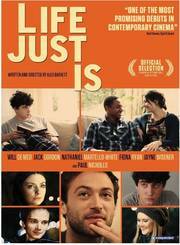 Take the debut feature from writer-director Alex Barrette, courtesy of Independent Distribution, the drama Life Just Is arrives in cinemas on 7th December and both DVD and Video on Demand on the 10th. Starring a Paul Nicholls, Jack Gordon, Jayne Wisener, Fiona Ryan, Nathaniel Martello-White and Will De Meo, this has a running time of 102 minutes. Expect a recommended retail price of around £13.99. Pete, Tom, David, Claire and Jay are a tight-knit group of friends who share neighbouring flats in London after recently graduating from university. As they hang out, throw parties and navigate the new responsibilities of adult life, romantic tensions begin to stir beneath the surface. When Jay begins a relationship with the much older Bobby and Pete goes on a quest to discover the meaning of life, their friendships are put to the test.